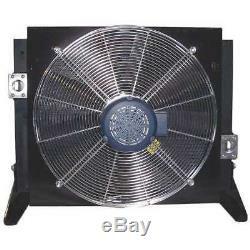 Forced-Air Bypass Oil Cooler, 30PSI, 3 HP COOL-LINE A90-3-BP30. Forced Air Oil Cooler, AC Motor, Flow Ranges 20 to 200 GPM, Voltage 230/460, Motor Amps 8.6/4.3, 3 Motor HP, Port Size 2 In SAE 4 Bolt Flange, HP Heat Removed 90, NEMA/IEC Frame 56C, Max Pressure 377 PSI, Max Temp 250, with 30PSI By-Pass Valve, Aluminum Construction, Black Painted Finish, Height 30.19 In, Width 37.01 In, Depth 23.3 In, Includes Mounting Feet. Zoro has a simple missionWe help small business stay competitive! We do this by offering thousands of great products at super low prices. We're coming for you, Buffaloes. More specifically, they are in California (one in sunny SoCal and one in breezy NorCal), Illinois (the Land of Lincoln), South Carolina (the Land of Mustard BBQ sauce), and Texas (the warehouse there is bigger). Like you, we believe that the key to success is to always put our customers first. The item "Forced-Air Bypass Oil Cooler, 30PSI, 3 HP COOL-LINE A90-3-BP30" is in sale since Tuesday, August 22, 2017. This item is in the category "Business & Industrial\Hydraulics, Pneumatics, Pumps & Plumbing\Pumps & Pump Accessories\Hydraulic Pumps".